After a seemingly endless wait, the highly anticipated Halo 2 has finally arrived on the Xbox. As the sequel to what many consider the best console FPS of all time, Halo 2 has a lot to live up to. Fortunately, the developers at Bungie have proven themselves up to the task by creating an epic quest that pushes the Xbox to its limits with amazing environments and frenetic play. The action is rock-solid and intense with Master Chief now able to hold two guns at the same time, but that's just the beginning. 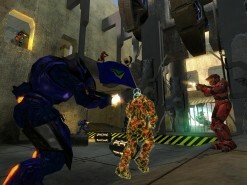 Of course, the even bigger news is Halo 2's excellent online mode, which now includes extensive Xbox Live support that lets you create Clans, set up game modes and play seamlessly throughout. These new features are impressive but does Halo 2 live up to its own ambitious goals? Join us as we jump into this epic battle and find out the answers. Without a doubt, Halo 2 is by far the most feverishly anticipated Xbox title to date by gamers everywhere. You've probably already heard about its record sales, but does the game itself measure up to the hype? The good news is that it delivers the addictive gameplay, polished environments and frenetic action players have been expecting. In fact, it seems to go beyond these expectations in some key areas. As usual, players can select from a single player Campaign mode, which itself offers several levels of difficulty. There are also several multiplayer options including LAN, System Link and an entirely new online mode that allows for some intense fragging action in a variety of co-operative and deathmatch modes. The game's new online modes are exciting but most players will probably want to play the Campaign mode first. Halo 2 picks up the story right after the first game, as the genetically enhanced soldier Master Chief escapes the calamity from the first Halo, while the Covenant forces try to pick up the pieces from their unexpected defeat. This definitely sets up some interesting situations and new questions, the answers to some of which are definitely unexpected. Its engaging plot makes this one of the more engrossing FPS titles on any console platform to date. The startling polish and surprising depth of Halo 2's backstory is definitely a key factor in keeping players motivated throughout their journey. Halo 2's highly polished gameplay will seem immediately familiar to veterans of the first game, but there are some key differences this time that make for an even more intense fighting experience. Players once again fill the shoes of the legendary Master Chief as he battles against the endless hordes of the Covenant. However, this time a few key differences make the gameplay even more elaborate and immersive than before. The basics should be familiar, but they've been enhanced to a great degree and many new abilities have been added. While the Chief can still take weapons from fallen foes, he can now hold two weapons at the same time or "Dual Wield", which is quite impressive. Even better, the weapons you Dual Wield don't have to be the same, so you can use the standard blaster in your left hand and a covenant plasma rifle in the other. However, some of the larger weapons such as assault rifles and sniper guns require both hands to hold. Another key difference is that you can now take weapons from your own living comrades and commandeer them to your own use. 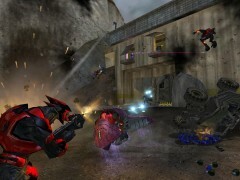 Players will find many of the same weapons this time around including rocket launchers, sniper rifles, grenades, pistols, shotguns and more on the human side as well as a variety of Covenant devices such as Plasma pistols and rifles, needlers, Carbine Rifles, and guns that shoot particle beams. Obviously, some of these are more effective against certain enemy types, though the best new weapon in Halo 2 isn't a gun. It is in fact the Covenant's new Energy Sword, which slices through even the toughest foes effortlessly at close range, making it one of the most effective weapons in the game. In addition to these new weapons, players have several new tactics they can use in battle. 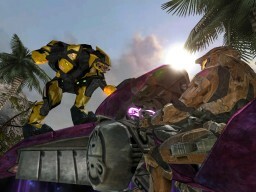 The biggest of these is the new ability to jump onto and take over covenant vehicles. This isn't as easy as it sounds, especially as they're moving along. However, you have to be careful since the enemy can jump onto your vehicles as well. This definitely plays a big factor in the gameplay, adding a layer of strategy and depth to the game that makes it go far beyond the first title. It also adds to the game's intensity since there's nothing more terrifying than having an Elite jump onto your Warthog and then having to fight it off. Halo 2's controls remain as intuitive and effective as they were in the first game, allowing you to switch weapons, take items, and change from first person, to sniper modes effortlessly. This makes combat quite intense, allowing players to focus on killing the Covenant fighters. The actual game itself is intense, as the action unfolds at an intense pace throughout the universe. Players will find a variety of locales ranging from distant worlds, spacecraft. They'll find themselves defending their home planet, and once again battling on a second Halo and then to a penultimate battle towards the end. The gameplay never stops, creating an almost breathless experience throughout that rarely lets up in intensity. 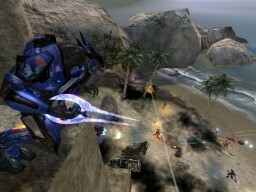 Players will battle many of the same covenant foes as the first game including the Grunts, Brutes, Drones, and Hunters. Players will also face the more powerful Jackals and Prophet Covenant forces along with unwelcome return visits from the Flood parasites. While many of the alien forces are the same, they seemed to have learned something from their previous battles, making their AI smarter and more aggressive. For example, you won't be able to throw a grenade into a group of foes and watch as they stupidly stand by and wait for it to explode. The Elites are also much tougher to kill and take cover, strafe more often than before. The intensity of the gameplay only ratchets up as you get deeper into the game's levels. Many recent games have tried and failed to create a believable world but Halo 2 succeeds in creating an elaborate suspension of disbelief that immerses players in its story and characters to a degree rarely seen. At the end of the first Halo, players were left with a satisfying conclusion, but also many questions. Halo 2 uncovers some mysteries about the Covenant and its religious motivations behind its war with humanity, but adds many more questions for players to ponder. While we'd like to delve deeper into some of these questions in our review, discussing some of these would undoubtedly spoil some of the biggest surprises in the game, so we'll leave some of those details for you to find on your own. Halo 2 will please fans with a more elaborate series of cinematic cut-scenes that delve much deeper into the rationalizations and politics driving this religious alien society. There are more than a few surprises and plot twists in the storyline to make it worth sitting through the cut scenes. You won't want to skip these, as in many other games since they actually enhance the game's impact. In fact, some levels won't make as much sense without viewing these first. This is especially rewarding since some of the between-level scenes lead you directly into some of the game's most engaging and interesting levels. The characterizations and deeper development makes for a much more satisfying experience, enhancing Halo 2's cinematic, epic feel. This elaborate approach extends into the main game and is fully integrated into the action. There's a lot more dialogue this time around from the other marines during combat, and more varied taunts from covenant fighters that gives the experience a realistic feel throughout. Halo 2's storyline is definitely effective at conveying a dramatic sense of scale to the battles, and giving players a real sense of the stakes involved in their battles. These elaborate cinematics heighten the action, and the in-game visuals that match them in terms of quality and presentation. Players will be astonished by the sheer size and magnitude of the game that features environments and levels that dwarf the first game's scale. Scan around some of the levels and you'll be amazed at the depth of the horizon, which seems to extend out thousands of miles. This creates an amazing sense of scale and proportion that can only be described as epic. Players traverse some truly amazing areas, all of which are rich in detail and design. The construction of each level is brilliant in terms of presentation and polish. The game's elaborate design is both consistent and varied from the architecture of alien temples, to the war torn streets of Earth, to the deceptive beauty of the new Halo itself, nothing in each area feels out of place. The environments themselves have new interactive features that allow players to blow up objects and crates and watch them fall over. The overall visual quality extends to the detailed character modeling and animation that exceeds the original game with vastly improved detail and movement evident throughout. The in-game graphics are some of the best seen on any console title to date, and nearly match the quality of the cinema sequences. This makes Halo 2 a seamless experience with a visual quality second to none. From an aesthetic standpoint, the game's overall design ranges from beautiful to ominous to intense, working these extremes effectively pushing the boundaries of what players have come to expect. Halo 2's soundtrack is likewise amazing, ranging from haunting choirs, to hard rock, to militaristic marches while fitting the action and pacing of the onscreen action perfectly. Likewise, the extensive voice acting brings even the supporting cast of characters vividly to life, creating a fleshed out experience. The Covenant sequences are also impressive and taken together, create one of the most elaborate cinematic approached seen in games to date. The production values are simply amazing, and match the gameplay's intensity perfectly, creating a vast and elaborate world that's truly epic in scale and nearly flawless in presentation. 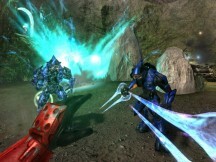 Halo 2's Campaign mode is an amazing experience in its own right, but Bungie has also added full support Xbox Live. Logging on is simple, and you can select which type of match you want to play in. You can play a Quick Match, select parameters for an Optimatch or invite players on your friends list for a Custom match. Players can also join parties, create clans to challenge other teams or, battle solo against another player. As you compete against other players and your skill increases, you'll find more worthy opponents at your skill level. Once you've selected the match type, you can choose to play several basic online modes including Slayer, a deathmatch mode, Capture the Flag and Assault, where you have to invade the opposing team's base, and King of the Hill mode. There's also a Juggernaut mode, where one player is the boss character and the rest have to get them, plus oddball where you have to hold the ball the longest and territory mode where the team that controls one area the longest wins. These modes offer plenty of variety and challenge for Halo veterans, though the game also offers beginner modes for novice players to practice. The online gameplay is just as intense and fast as single player, and the sheer number of maps and modes gives this plenty of depth. Even better, the game's support of Xbox Live means additional content such as new maps and online modes will probably be offered later on. Unfortunately, we experienced some minor glitches such as dropped games or extended pauses during some of our matches. Additionally, it seemed to take an unusually long time to locate players and initialize new games. Most likely, these glitches can be attributed to the sheer number of players online, since the servers are probably overwhelmed by the crush of gamers. 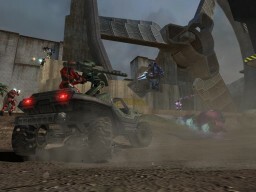 Despite these problems, Halo 2's online modes are expertly crafted and should please those who love playing online. These minor flaws with the online modes shouldn't dissuade players one bit, since Halo 2 is otherwise a nearly perfect gaming experience. While the glitches are slightly annoying, players will still find one of the best online console modes ever created. The intensity of these online battles matches the single player Campaign mode, truly showcasing the potential of Xbox Live. The overall quality of the title is simply unbelievable, from the smallest details to its epic scale, Halo 2 represents the pinnacle of current game design. The visuals are a remarkable leap forward and eclipse the first Halo in almost every area. Halo 2's beautiful character animations and seamless integrated environments create a breathtaking sense of realism. Likewise, the game's narrative moves forward at a fast clip, revealing mysteries from the first game while raising more questions on its own. The gameplay remains what truly separates Halo 2 from the pretenders, with its silky responsive and intuitive controls marking it as the best playing FPS on any console to date. The intense battles, sophisticated AI and ingeniously designed maps will pose quite a challenge for most players, especially in the latter stages and harder difficulty levels. Millions of gamers have been waiting for Halo 2's arrival, and we're happy to report it delivers the kind of breakthrough experience they've been waiting for. Few titles in recent years have come as close to creating such a flawless, immersive experience as Bungie has created. Halo 2 is a triumph in almost every area. This near perfection means the waiting has been worth it making this an absolute must for every Xbox owner.